Oslo Cathedral (Oslo domkirke, previously the Our Savior's Church) was finished in 1697. It is located at Stortorvet square north/north-east of Karl Johans gate (Oslo's high street), between Kirkegata and Dronningens gate. The Cathedral's lower end is surrounded by the Bazar, a curved long building also called 'Kirkeristen' (completed 1856). Integrated with the Bazar on the side of Karl Johan is the Fire Watch that served as Oslo's main fire station from 1860 until 1939. The Cathedral itself, the Bazar and the Fire Watch are all built in red brick. The Fire Watch has a tower covered in green copper like the Cathedral. The Cathedral is laid out like a Latin cross. Oslo Cathedral is the main church for Oslo bishopric as well as parish church for downtown Oslo. 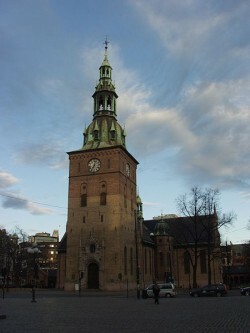 The Royal Family and the Norwegian Government use the cathedral for public events like weddings and funerals. The Nidaros Cathedral was the office of Norway's archbishop during Catholic times, and Nidaros Cathedral in Trondheim is still regarded as Norway's most significant church. The current Oslo Cathedral is the third cathedral in Oslo, Norway. The first, Hallvards Cathedral, was built by Sigurd I of Norway in the first half of the 12th century, and was located by the Old Bishop's Palace in Oslo, some 1.5 kilometers east of today's Oslo Cathedral. For almost 500 years, Hallvards Cathedral was the most important church in the city. In 1624 Christian IV decided to move the city a few kilometers west to be protected by Akershus Fortress. After that, Hallvards Cathedral fell into disrepair and decayed. In 1639 the second cathedral was built (Hellig Trefoldighet). This cathedral burnt down only 50 years after it was built, and the current cathedral was built.